Wellington, Alexander Turnbull Library, MSR-08 (Margaret M. Manion, Vera F. Vines, and Christopher de Hamel, Medieval and Renaissance Manuscripts in New Zealand Collections (Melbourne, London and New York: Thames and Hudson, 1989), no. 150), Eutropius, Historia Romana, Italy, second half of the fifteenth century. 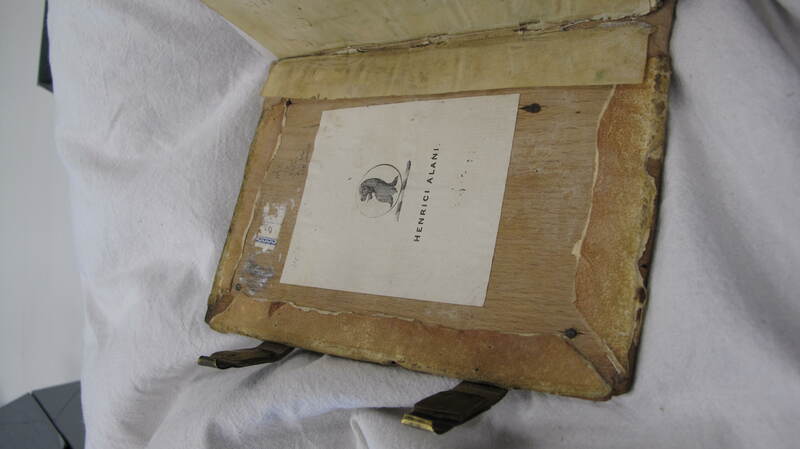 This book is bound in boards, covered in tawed leather (stained red, which can be faintly seen on the turn-ins, but faded back to white on the outer face). The cover has been blind ruled (“triple lines in a panel with a central saltire,” from Manion, Vines, and de Hamel’s description). The boards’ edges are beveled; they have been attached to three double, red-stained, tawed sewing supports, visible at the hinge. In this case the bright crimson colour is well preserved. 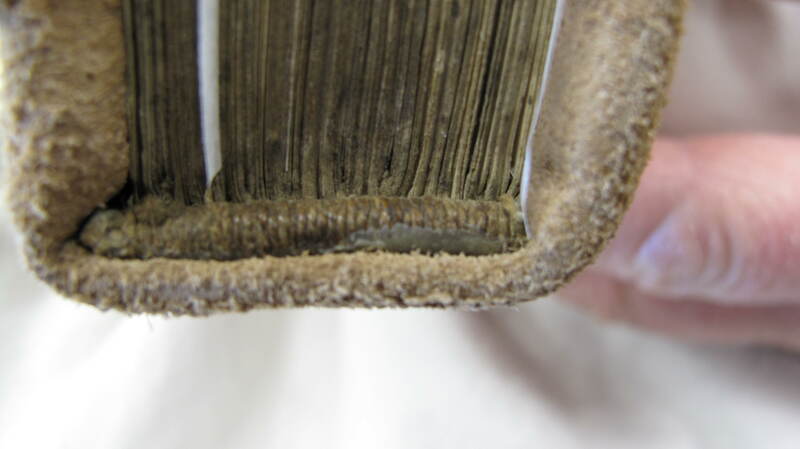 The book has been rebacked but it appears to us that the supports were laced directly into the spine edge of each board, somewhat unusually for a fifteenth-century binding. 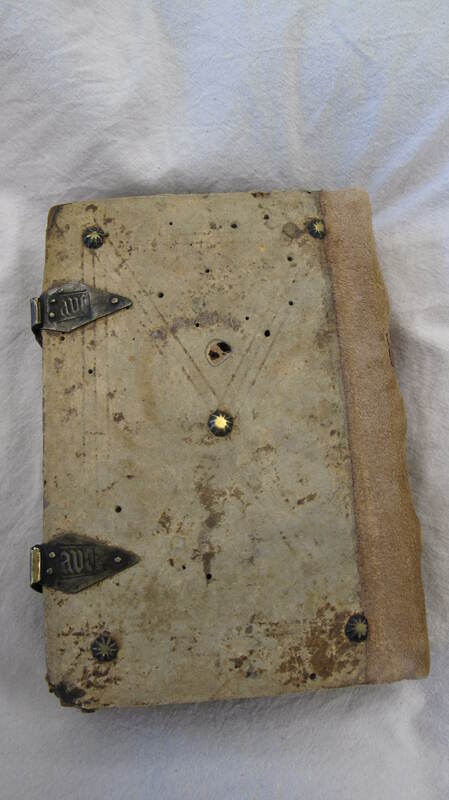 Along with the tawed skin (which was increasingly replaced by tanned leather skin in bookbindings in Northern Europe after 1450), this feature of the binding suggests to us a date for the book slightly earlier than that given by Manion, Vines, and de Hamel, perhaps the first rather than second half of the fifteenth-century, though the binder may simply have been conservative in the particular techniques. The book’s furnishings are, unusually, intact; on both boards are five small radiating brass bosses. There are two hook-clasp fastenings that close top to bottom in the Italian style. 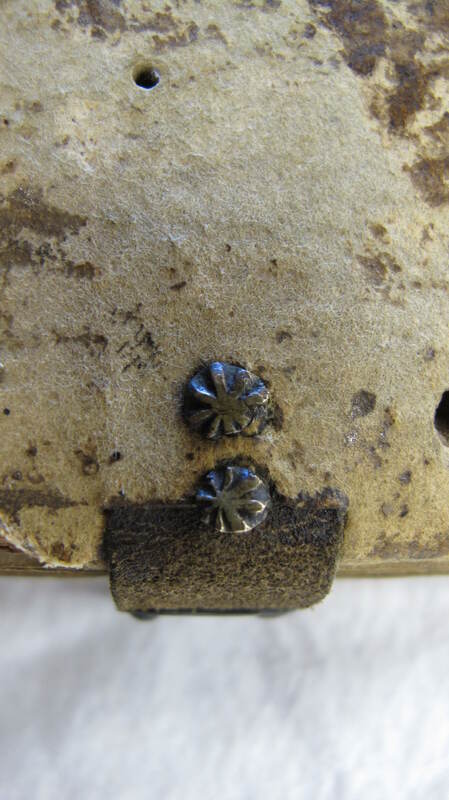 The short tawed strap that bears the clasp is affixed beneath the upper cover by two radiating brass nails; the hooks and the catch plates on the lower board are similar to Szirmai, Fig. 9.47, types [c] and [d]. 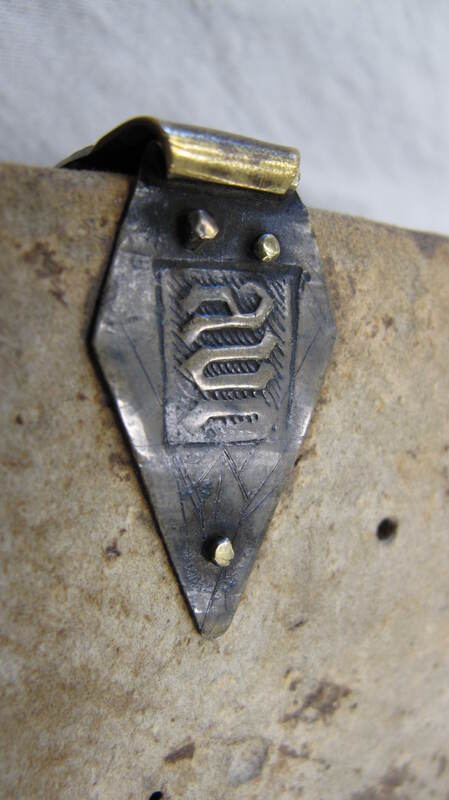 The metal used was embossed with “aue” on the catchplates and with what appears to us to be part of the word “maria” on the hooks, cut off awkwardly when the metal was, in all likelihood, cut from an Ornamentblech, like the clasps on Auckland Libraries, Sir George Grey Special Collections, Med. MS G.120, described in our Script & Print article, pp. 217-9). Two endbands—plain thread over a single core, laced into the edge at the corner of the boards and nailed—also survive. 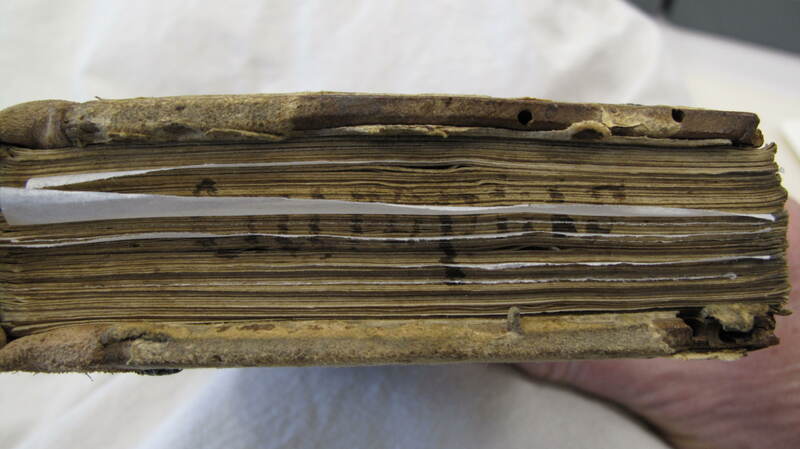 The book’s title appears on the tail-edge and, faintly, fore-edge of the textblock: “eutropius” in a Roman script. J. A. Szirmai, The Archaeology of Medieval Bookbinding (Farnham: Ashgate, 1999), 252.